The 4D Discovery application for Windows Phone is a 4D Augmented Reality Browser that brings for the first time together geolocation Web data in a unique A.R. way. It’s an effort to bring to you a really innovative, exciting A.R. app. 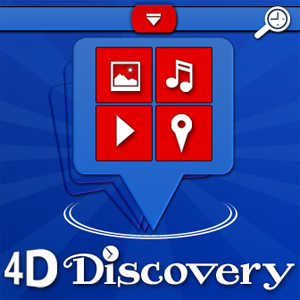 If you just like your Windows Phone, with 4D Discovery you will love it! in an A.R. new style. by browsing old photos shooted here or things that took place someday by exploring videos recorded here. You may also discover events that will take place here in the future. or you just tap on the Live Walk option, select the proximity you want and everything near will be showed up. Map, List or 4D Camera. When available, a timeline list is added in the results, so you are able to view the results by the time they created (4D). Future versions will include some of the Web 3.0 L.O.D. geocatalogs:Wikipedia,Open Street Map data,Youtube. 4D Discovery is provided to you free and it will remain free (ads only on 1st form). If you like it, please give us a good rating or write a review. If you have problems, contact us by support. If you want extra features or services, please tell us. As far as we know there isn’t such application exist for any smartphone platform (iPhone, Android , Windows) so we are very proud!